Providing cost-effective services to the upper Midwest since 2004. We are your trusted source for quality industrial vacuuming and cleaning services, including vacuum loading services, dewatering tank cleaning, sludge pumping, steam cleaning, high pressure washing, liquid vacuuming, oil/water separator cleaning, and more. Hydro-excavation involves the use of specialty trucks to excavate around utilities and sensitive areas with medium water pressure and removing soil with the vacuum truck. With our hydro-excavation vehicles, sewer trucks and excavating trucks, jetters, accessories, and safety equipment, our highly skilled technicians are able to solve any project challenge. We offer a range of safe and effective water blasting services. Water blasting is an environmentally friendly, effective method used to clean surfaces. Water blasting—also known as hydro blasting and water jetting, among other names—involves the use of high-pressure water to remove scale and other types of debris from a surface. We remove roof ballast—ranging in size from pea gravel and potato stone, to coarse river rock, as well as non-embedded dirt and debris—to ensure roof readiness for repair or resealing. 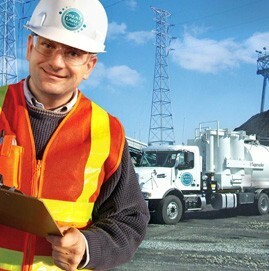 We are an experienced environmental services company that provides reliable and cost-effective services for a wide range of industries and environmental professionals. Using advanced technologies, we help customers throughout the Midwest to attain cleaner, safer, and compliant operations, facilities, and job sites. Our highly skilled technicians and fleet of vacuum trucks, high and low pressure water blasters, jetters, accessories, and safety equipment are able to solve any project challenge.